Affectionately dubbed “the little sparrow” and “la môme” (the kid) in France, Edith Piaf is a musical legend who has (rather surprisingly?) resonated with successive generations of listeners. Thanks in part to Olivier Dahan’s biopic starring Marion Cotillard, “La Vie en Rose”, the haunting life and work of the singer-songwriter have become far more prominent in the global popular imagination over the past few years. 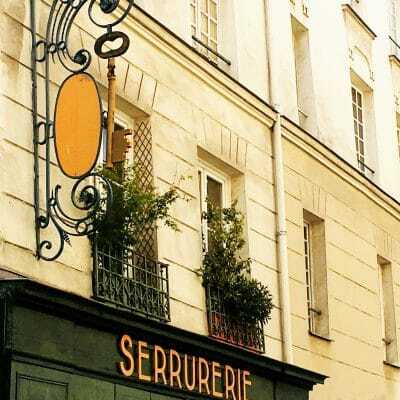 Whether you’re a long-time fan or have only recently discovered Piaf’s moving and oddly gritty vocal stylings on songs such as “Je n’en connais pas la fin” or “C’était une histoire d’amour”– two of my own favorites, incidentally– read on to learn about 4 places that are decidedly haunted by her presence. Places where you can both pay hommage to “the little sparrow” and learn more about her life, work and legacy. 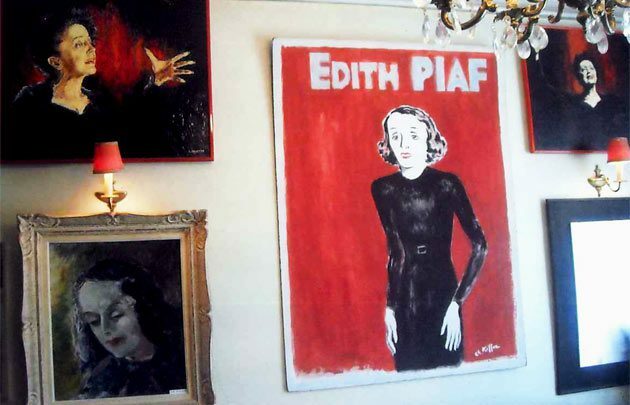 This free private collection housed in one of Piaf’s former apartments plunges you into the daily life of the singer, showing a more quotidian and untortured side of an icon who has too long been primarily associated with addiction and tragedy. Piaf, who was born in the working-class district of nearby Belleville, lived here as a young woman, when her career was just starting to blossom. One of her iconic black dresses is on display, alongside a collection of books, paintings, photos, textiles and other personal items. There’s also an onsite shop where you can purchase books, albums and other memorabilia. Visits are by appointment only: call ahead at the number below if interested. This is a small Parisian museum that certainly deserves more attention, in my book. Side note: After visiting this collection, I recommend taking a short, aimless stroll through the fascinating, wholly unpolished streets of Belleville (Metro: Belleville) to get a better sense of where Piaf grew up. It’s only 10 to 15 minutes away on foot from Ménilmontant. According to legend, she was born under a lamppost at 72 rue de Belleville, but the more likely scenario is that she came into the world at the nearby Tenon Hospital. A plaque can be seen under the lamppost where she was allegedly born on December 19th, 1915. More than any place in Paris, the Olympia Music Hall is filled with the spectres of musical legends past. 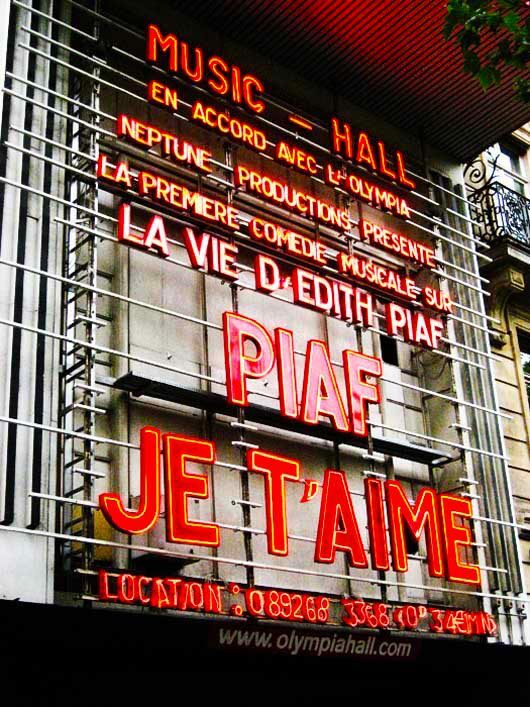 Piaf performed here numerous times at various stages of her career, notably giving one of her moving later performances of “Je ne regrette rien” to an audience of rapturous fans. This short video shows her only three years before her death in 1963. 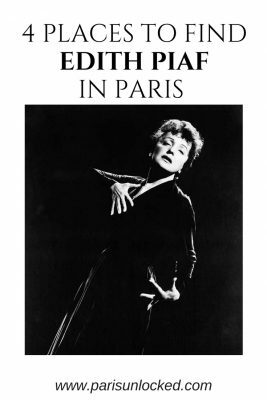 The Olympia is so associated with the legend of Piaf that it has staged hommages to her in the past, including a thematic musical that offered renditions of some of her most beloved songs. Only a short walk from the Palais Opera Garnier, the venue is well worth a visit- even if you just take in the vintage facade and admire the photos of legendary performers plastered on the walls around the box office. Very few visitors bother to venture to the eastern edge of Paris known as the Porte de Bagnolet. Residential and apparently uneventful, it’s not an area that’s exactly brimming with tourist attractions. 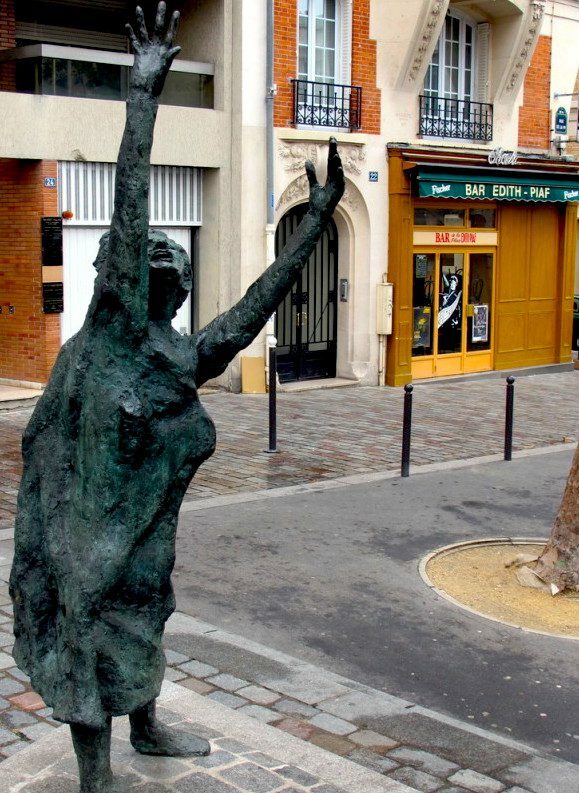 Yet for Piaf enthusiasts, it’s an essential stop: home to the Place Edith Piaf and the contemporary statue that graces its center. The city of Paris commissioned the artist Lisbeth Delisle to create a sculpture to commemorate the iconic singer in 2003, to be unveiled for the 40th anniversary of her death. The bronze work stands slightly taller than Piaf was herself, but it’s still built on a human scale, rather than a larger-than-life one. 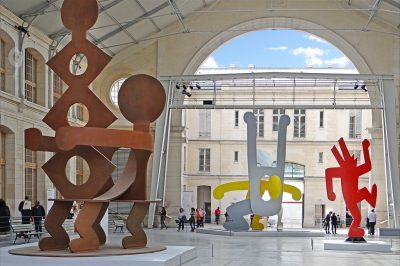 While the statue has gradually gained recognition and admiration, it initially wasn’t especially admired (a bit like the Eiffel Tower, the Centre Pompidou, and other now-iconic monuments that were loathed when first unveiled). “It’s not “beautiful”, we hear people saying. It’s true that it isn’t “beautiful”, like the Saint Sulpice virgins or Claudia Schiffer. 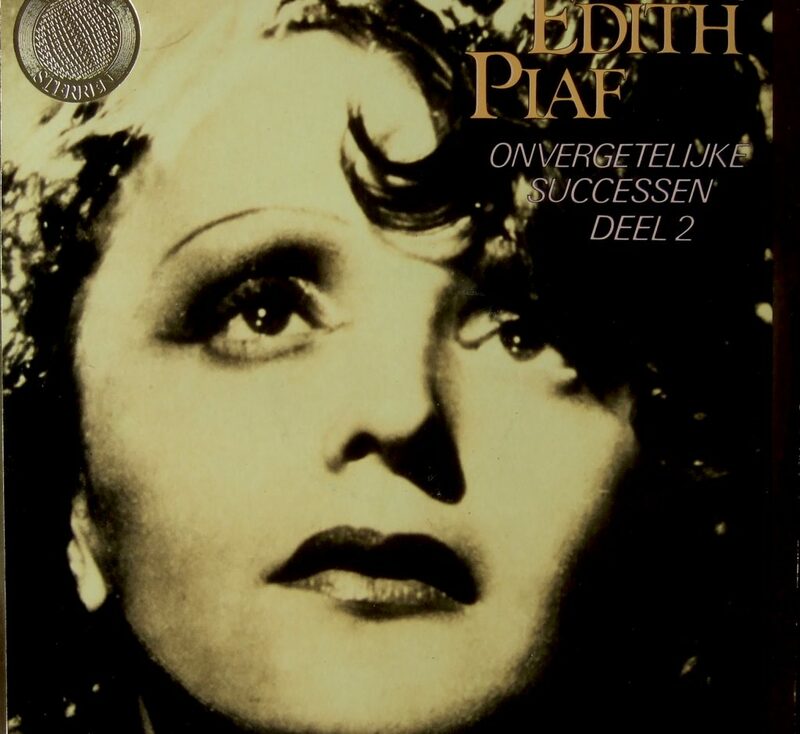 Edith Piaf wasn’t “beautiful”; she was much more than that, she was moving. This statue is just and does her justice. This little bent, tortured body attempting to catch the sky evokes her perfectly. Whatever your own verdict, make sure to venture out to far-east Paris to judge it in person. To continue your hommage, consider having a cup of coffee or drink at the Bar Edith Piaf just behind the statue on the square. 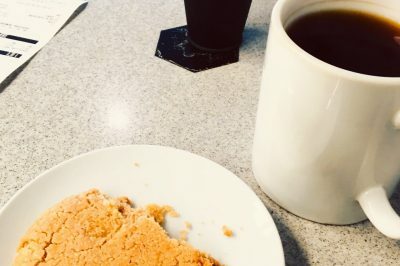 It admittedly has no “real” connection to the “little sparrow”, but never mind. Edith Piaf’s well-loved grave at Père-Lachaise cemetery in Paris. Conclude your self-guided Piaf tour by visiting her well-loved grave at the lovely Père-Lachaise Cemetery, not far from the square and statue at Porte de Bagnolet. You can either easily walk (20 minutes), or hop on line 3 for a quick jump between the sites. 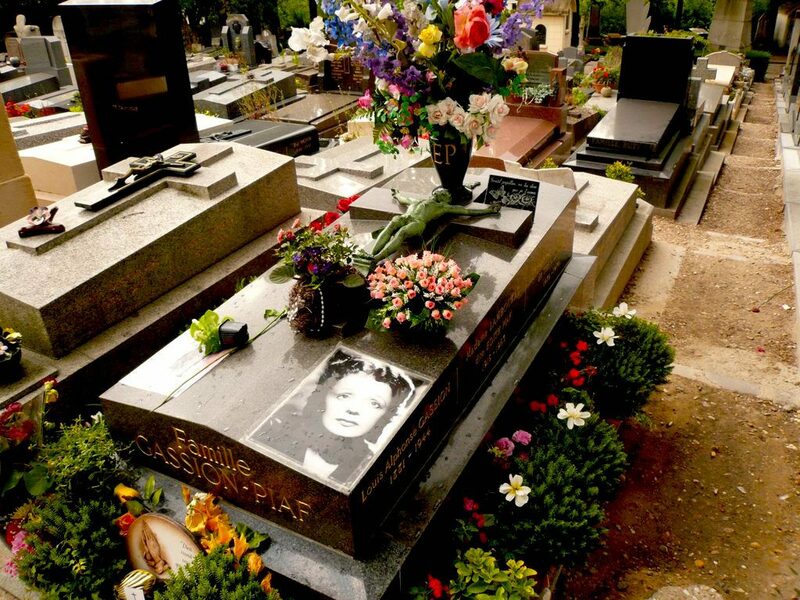 The tomb, which is also the resting place of certain of Piaf’s family members, is well-kept by visitors and fans, surrounded by flowers and images of the legendary songstress. Take advantage of your pilgrimage there to explore the enormous, leafy, peaceful grounds of Père-Lachaise. Oscar Wilde, Frederic Chopin, Jim Morrison, Colette, and Victor Hugo are among the other famous and defunct denizens there. 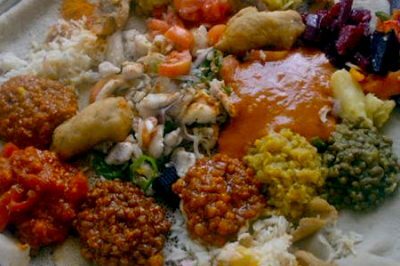 If you’re on a modest to tight budget, you can save both money and time: Book skip the line tickets on numerous top attractions, and on lively cultural tours (via Tiqets.com). 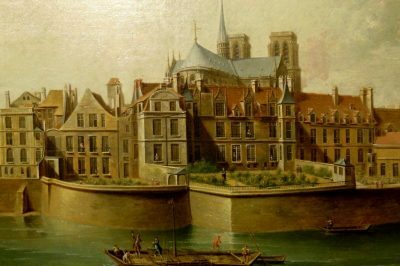 If you’re interested in taking a guided tour of Paris that’s especially tailored to women, consider those offered by Girl’s Guide to Paris. If you decide to book, mention “Paris Unlocked” to receive a very special Girl’s Guide to Paris gift alongside your tour. To save on getting there, book rail tickets and special-offer passes here (via Rail Europe). For flights, you can often find excellent deals at Skyscanner.